Parameter estimates of the model fit are shown in Output 73.12.1. 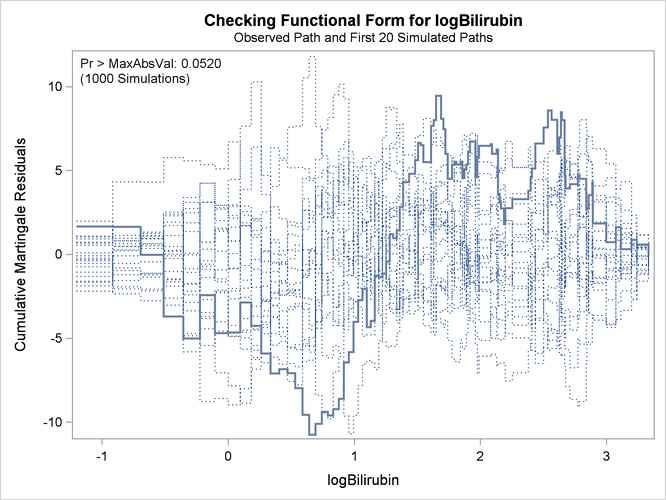 The plot in Output 73.12.2 displays the observed cumulative martingale residual process for Bilirubin together with 20 simulated realizations from the null distribution. When ODS Graphics is enabled, this graphical display is requested by specifying the ASSESS statement. It is obvious that the observed process is atypical compared to the simulated realizations. Also, none of the 1,000 simulated realizations has an absolute maximum exceeding that of the observed cumulative martingale residual process. 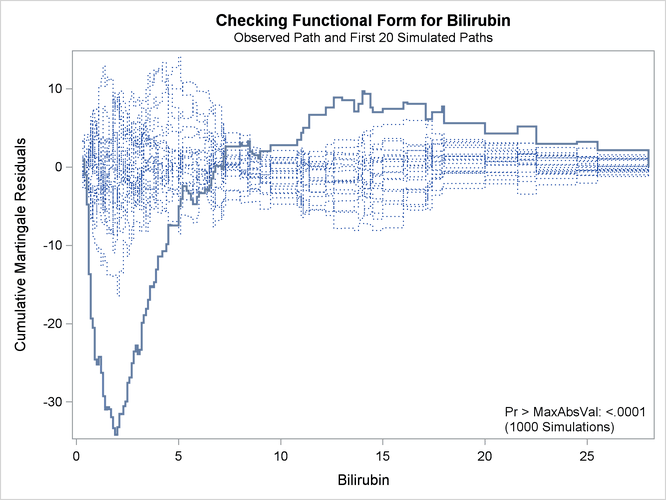 Both the graphical and numerical results indicate that a transform is deemed necessary for Bilirubin in the model. The cumulative martingale residual plots in Output 73.12.3 provide guidance in suggesting a more appropriate functional form for a covariate. 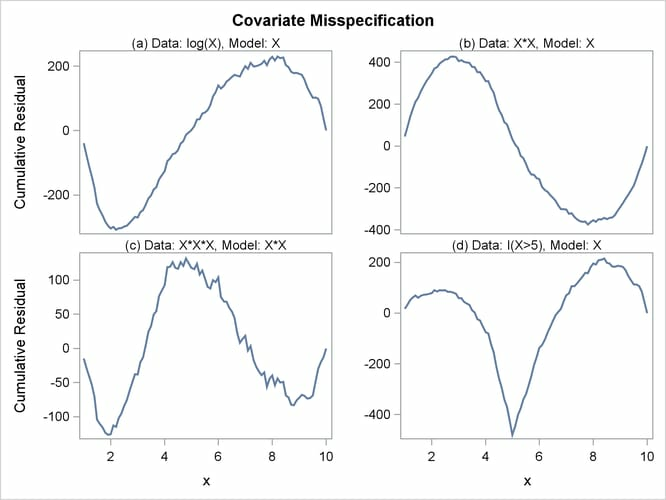 The four curves were created from simple forms of misspecification by using 10,000 simulated times from a exponential model with 20% censoring. The true and fitted models are shown in Table 73.19. The following statements produce Output 73.12.3. The curve of observed cumulative martingale residuals in Output 73.12.2 most resembles the behavior of the curve in plot (a) of Output 73.12.3, indicating that log(Bilirubin) might be a more appropriate term in the model than Bilirubin. Output 73.12.4 displays the parameter estimates of the fitted model. The cumulative martingale residual plots in Output 73.12.5 and Output 73.12.6 show that the observed martingale residual process is more typical of the simulated realizations. 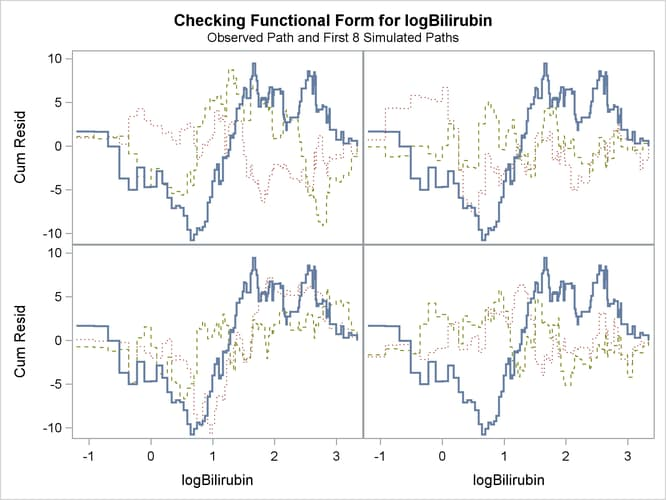 The p-value for the Kolmogorov-type supremum test based on 1,000 simulations is 0.052, indicating that the log transform is a much improved functional form for Bilirubin. 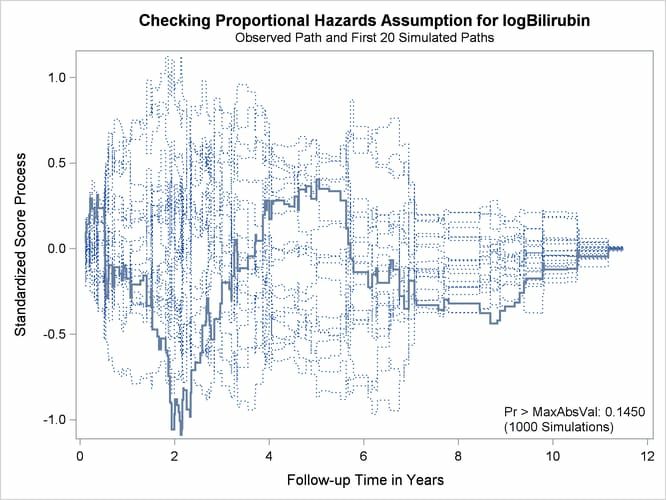 Output 73.12.7 and Output 73.12.8 display the results of proportional hazards assumption assessment for log(Bilirubin) and log(Protime), respectively. 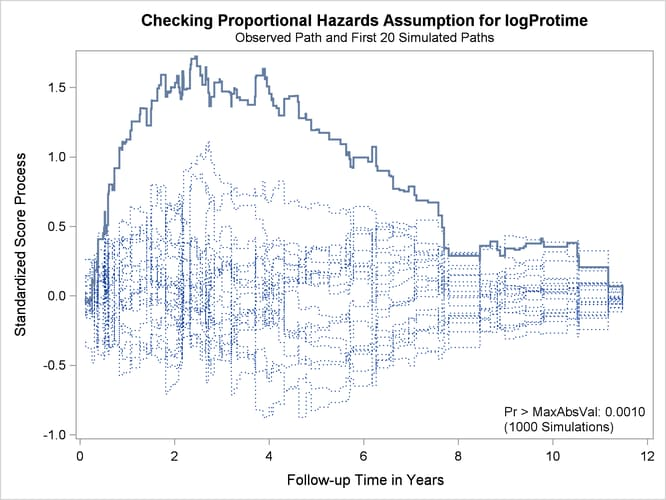 The latter plot reveals nonproportional hazards for log(Protime). Plots for log(Albumin), Age, and Edema are not shown here. The Kolmogorov-type supremum test results for all the covariates are shown in Output 73.12.9. In addition to log(Protime), the proportional hazards assumption appears to be violated for Edema.